The course is designed with a ‘community’ approach so that the course will pose challenges to professional and amateur golfers alike. Its topography, lush green landscape, impeccable course condition and unparalleled service earned this course the nickname the ‘Sleeping Dragon’ among its members. The DragonRidge clubhouse offers more than just a social venue for members within MacDonald Highlands. You will find a top-notch steakhouse, Montrose Steakhouse, lead by international chefs, the newly remodeled Onyx Bar, Dragon Grill, two lounges and a ballroom to accommodate social events. In addition, there is also the Jack Nicklaus Academy of Golf with PGA professional staffers who provide lessons for members and offers an extensive range of golfing merchandise, complete with a practicing facility for those who wish to polish their golfing skills. 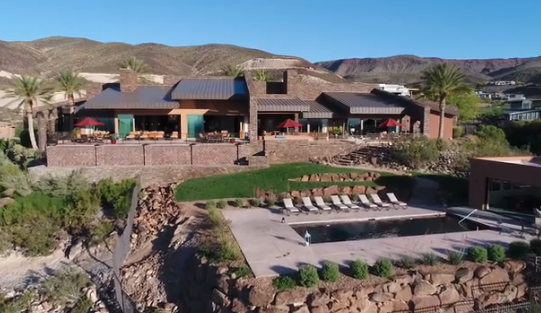 A swimming pool is an essential part of a clubhouse, thus DragonRidge’s clubhouse includes a large swimming pool with a magnificent view of the Las Vegas Valley.